Our Non Return Clamped Check Valves are designed to prevent reverse flow.Concentric and eccentric styles as well as our tapered disk design are available for horizontal,vertical applications and are working well without leaking while getting a return pressure.Our special designed Check valve can be used for many applications in such as food, dairy, beverage,pharmaceutical, chemical, and many other industries. 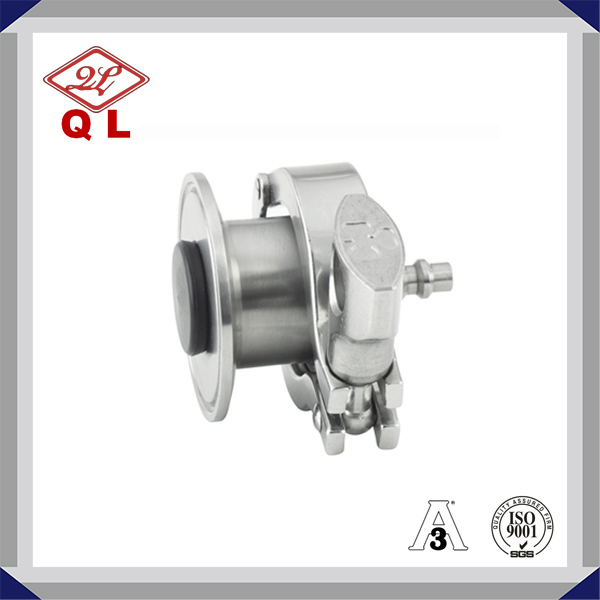 Stainless Steel Sanitary Non Return Clamped Check Valve is a type of valve which open or close rely on the medium flow itself. The check valve disc will open when the pressure of stem bottom exceed the stem above. 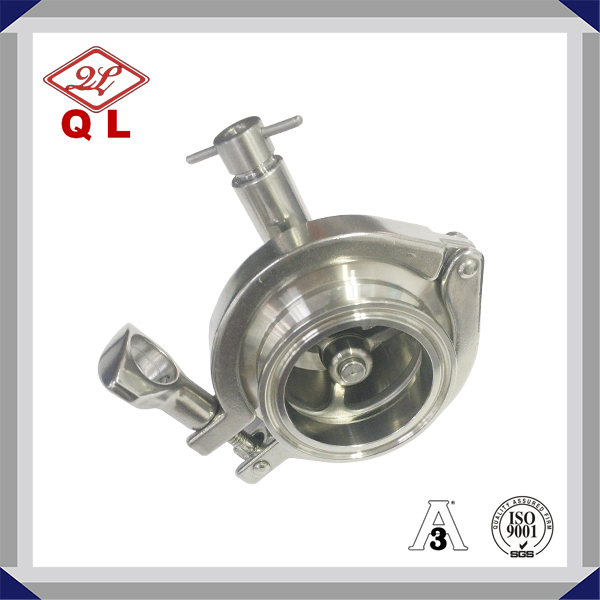 The check valve disc will close when the two pressure are equaled. So that the flow goes one way in the pipeline, and prevent the fluid flowing back, avoid the accidents.Various standards of valves can be provided to clients: DIN, 3A, SMS, ISO/IDF, BS/RJT, ASME/BPE etc. 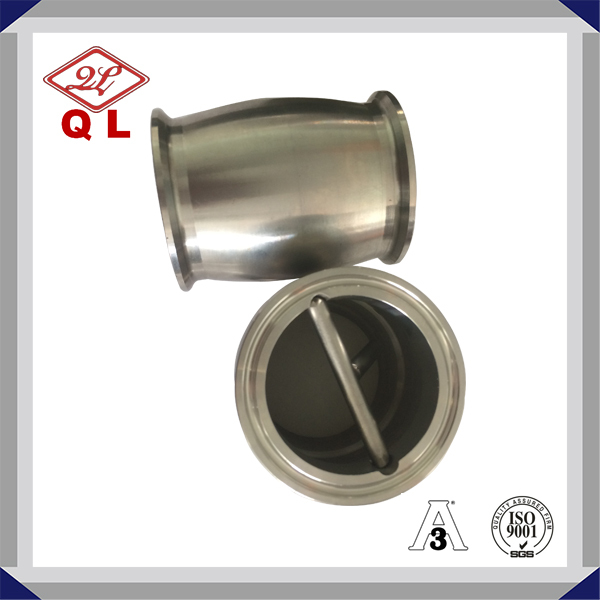 The body of check valve is divided into two parts, they are together by the clamp, and also use a special gasket for seal. A guide discs and four guide bar are used to guide the spring, which equipped with spindle with O type seal. This type of check valve connection: weld, clamp, and male. All check valves are suitable for all kinds of pipeline connections. Our products adopt production craft and technology from EU, and meanwhile import foreign advanced numerically controlled machine tools and other process/inspection units. 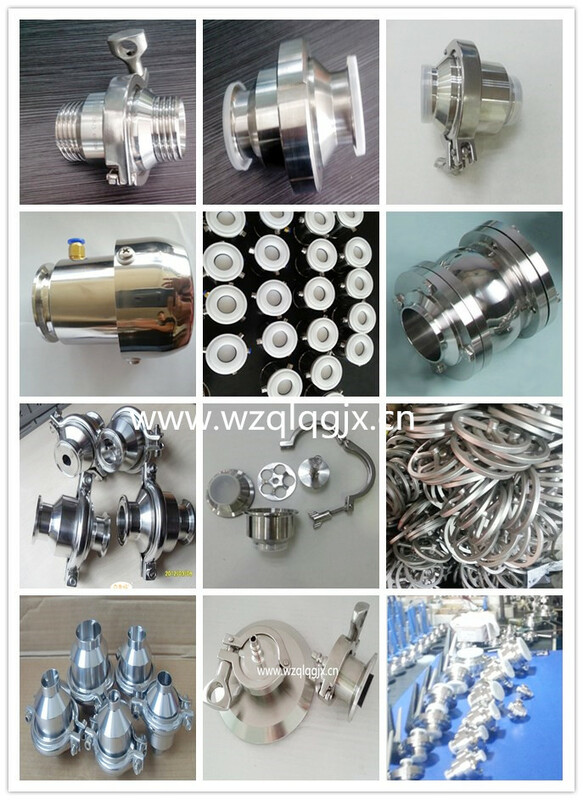 Our company specializes in producing sanitary stainless steel fluid equipment, valves and pipeline connection units. All the products are strictly manufactured according to different smoothness, material and sector's standards (such as ISO, DIN, IDF, SMS and 3A) etc. Under the efforts of all scientific research personnel. We are keeping on developing new products. Our products are widely used in the fields of food, pharmaceuticals, dairy, beer, beverage and chemical industry, all the technical aspects have reached the international leading levels and are in conformance with GMP requirements. Large quantities of the products are exported to USA, Europe, Middle East, Southeast of Asian and other countries all over the world. Honestly, open-mind and development are our company's operation conception. We will appreciate and accept the client's supports and valuable suggestions. All those inspire KAIQUAN people to perfectly combine the high-quality materials, sophisticated designs, strictly manufacture process and quality assurance system. The trust of our clients make us a responsibility to provide them with the best products. 1.Are you a trader or manufactory? 2.Can your products reach to FDA , CE and 3A requirements? 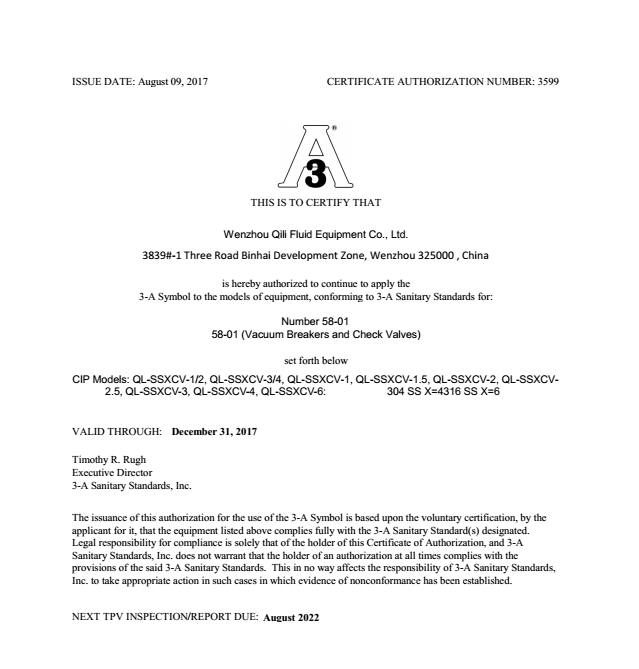 Yes, all of our material can reach to the requirements of FDA, ISO and 3A Certificate). Sanitary Butterfly Valve, Sanitary Check Valve and Diaphragm Valves, as well as Various Tank Accessories: Sight Glass, Strainers/Filter, Cleaning Ball, And other Pipe Fittings, (Pipe Unions: SMS, DIN, IDF, RJT, 3A,DS; Fittings: Ferrule,Elbow, Tee, Reducer and all other Non-standrad fittings), each products are tested well by our strictly Quality Control System, and we also have excellent service to support you and promote your business. For large quantity, as usual, it can be sent out within 20-40 days. Small parcel will be dispatched by DHL, FedEx, UPS OR TNT Courier. Big cargo will be delivered by Air freight or By Sea. We can provide samples production and service. Usually 2 to 5 days, the sample can be sent to your hands. We will choose the shipping way as you required: By sea, by air or by express. Any question about samples, please contact us. We will finish the production within 20-40 days after payment has been confirmed. We will choose the delivery way as you required: By sea, by air, by express ect. Save your cost is our mission. Any question or problem will be respond within 12 hours. Any problem happened to our product, we will do our best to help client to solve it, spare parts will be half price in lifetime. If you can't solve the problem in your local, please delivery the product to us, we will repair it and then back to you. All the products are calibrated with real working condition, and tested before shipping as qualified product. Looking for ideal Non Return Clamped Check Valve Manufacturer & supplier ? We have a wide selection at great prices to help you get creative. 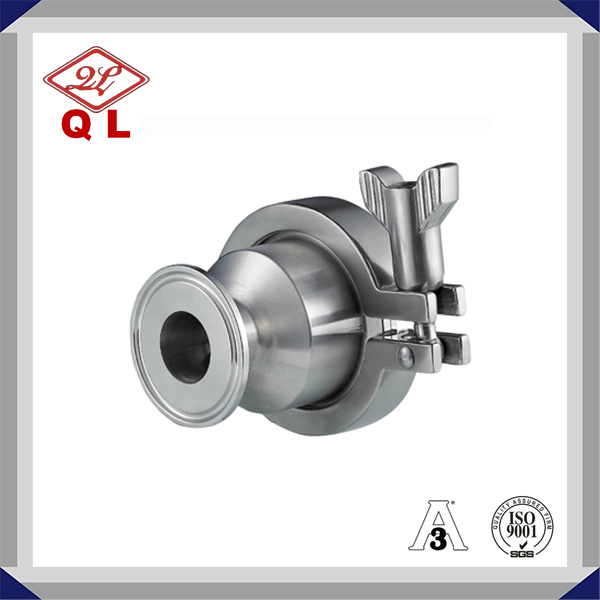 All the Sanitary Non Return Clamped Check Valve are quality guaranteed. 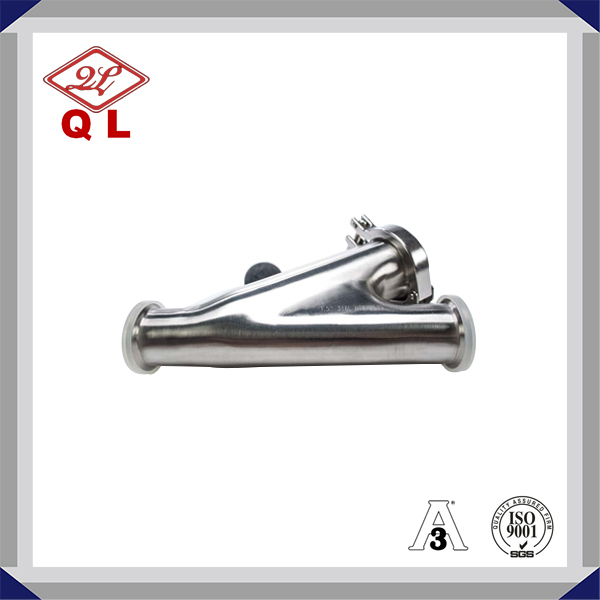 We are China Origin Factory of Sanitary Clamped Check Valve. If you have any question, please feel free to contact us. 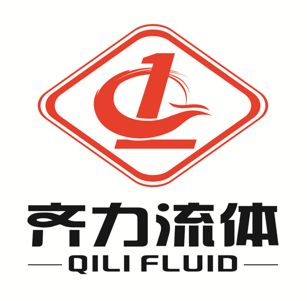 Copyright © 2019 Wenzhou Qili Fluid Equipment Co., Ltd. All rights reserved.